Many of customers and users of ShixxNOTE 6.net program didn’t send email note. But recently one customer asked me more about sending note via email. So now I decided to write about how to send note via email. If you didn’t know when you open “Send note to” others dialog from note menu you get send note dialog. Program already read your network neighborhood and you can see a list of computer in your LAN in the left list. From that list you can select recipients from your LAN, but also you can enter in a text box above for example some email address like somebody@gmail.com and when you press enter that mail address will be added in note recipients list. Also you will see different icon instead of computer you will see small Outlook Express icon before email address. When you have finished adding recipients then you click on big “Send note” button. I suppose that you will be asked by Windows Mail or Outlook if you want allow ShixxNOTE program to send email to mail recipients. You must click on button “Allow”. After that your email client will send ShixxNOTE note via email with all data in it and with picture of note as an attachment. Now recipient will get in his Inbox new ShixxNOTE email message which looks like this picture (my mail client is Outlook). 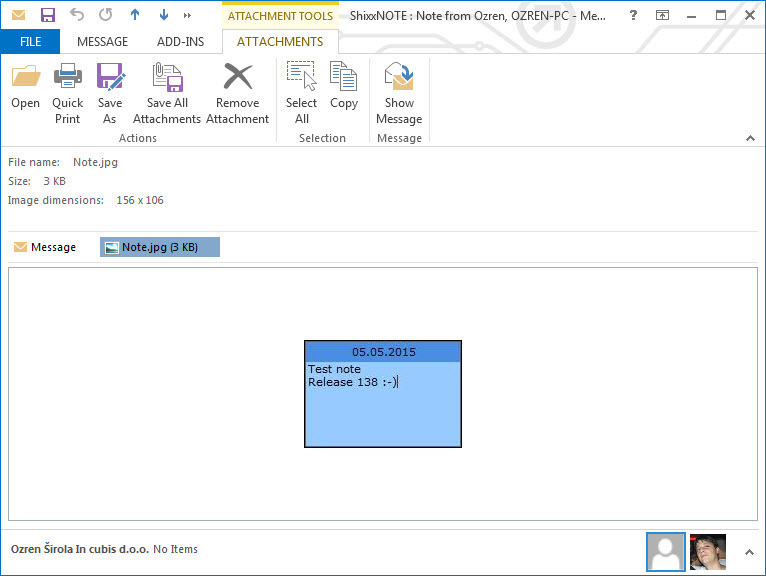 Outlook mail with all data necessary for ShixxNOTE program to create you same note on your desktop. Outlook mail with picture of ShixxNOTE note sended to you. You can see on both pictures what program sended. All data necessary for note creation and an attachment of note picture. 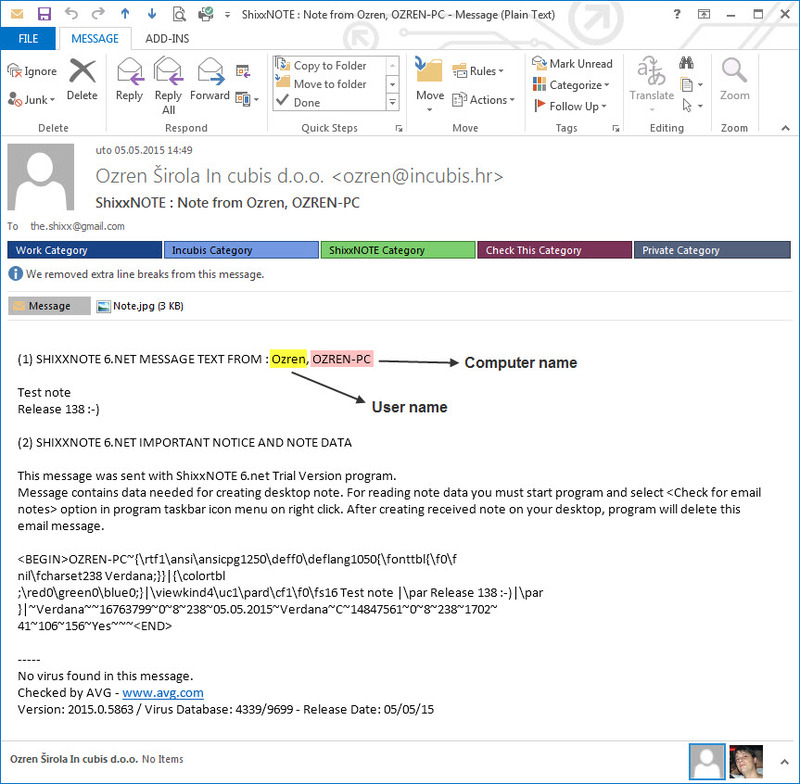 But also you can see in a subject text of the email something like this “ShixxNOTE : Note from Ozren, OZREN-PC” which means that note was sended to you from user Ozren who works on OZREN-PC computer. Before I had some problems with sending email notes and getting correct user name but now everything is working fine. After you received ShixxNOTE note you can click on ShixxNOTE main menu item “Check for email notes” (check previous posts to see how to get main program menu) and program will search your Inbox for ShixxNOTE program emails and will create exactly the same note as sender have sent to you on your desktop. I hope you will use this option more now when you know how to send and receive ShixxNOTE email notes.